I am convinced that if we are to get on the right side of the world revolution, we...must undergo a radical revolution of values...we must rapidly begin the shift from a thing-oriented society to a person-oriented society. When machines and computers, profit motives and property rights are considered more important than people, the giant triplets of racism, extreme materialism and militarism are incapable of being conquered.Dr. Martin Luther King Jr. The early 21st century marks an extremely interesting period of time. On one side we see many clear and present problems that, as this essay will discuss, show an accelerating gravitation toward further negative consequences, both environmental and social. Yet, on the other side, an ever present and accelerating solution orientation, technically, reveals so much potential to change course for the better, positive future possibilities appear profound and limitless. To the casual observer, the idea that “the worst is over” regarding the evolution of human culture may appear intuitively accurate, depending on where one resides on the planet. We have seen an overall increase in life expectancy, an overall decline in behavioral violence, a rising standard of living on the whole in the Western world, along with a generally maturing global culture which has been inching its way out of vast periods of bigotry, sexism, racism, and nationalism, further promoting a much needed global consciousness. Yet, the truth of the matter is that any such social “progress”, specifically the overall standard of living elevation occurring due to our technological ingenuity, is actually amalgamating within a highly detrimental framework that has just started to really reveal itself as such. These surfacing problems are of a scientific nature, not an ideological one. The fact is, market capitalism, no matter how you wish to regulate it or not regulate it, contains severe structural flaws, which will always, to one degree or another, perpetuate environmental abuse and destabilization, along with human disregard and caustic inequality. As expressed at length in other essays, this market/trade concept manifested out of an environmental condition which viewed all material things in the world as universally scarce. This has forged a competitive and invariably exploitative value system that generates certain behavioral propensities and loyalties that are misaligned with the natural order of reality, as per our modern environmental and sociological understandings. The difference between capitalism's effect today and in the 16th century is that our technical ability to rapidly accelerate and amplify this competitive and exploitative process has brought to the surface consequences that simply couldn’t be recognized or even anticipated during those earlier periods. Today, we are seeing the surfacing of these previously hidden tendencies in full force, and the end result is that what we see as progress now will likely be overcome, in time, by the larger order force of capitalism's misaligned detrimental principles. It is like a massive tidal wave which has been on pace to crashing on a ship for a very long time and no matter how well developed and organized that ship is, it is no match for this larger order force of nature. Perhaps the most notable example of this is the fact that virtually all life support systems are in decline. It really doesn't matter how many people have achieved a coveted, ideal, upper-class lifestyle if it is occurring on the back of unsustainable methods. It is simply a matter of time before the effects of resource depletion; biodiversity loss and pollution evolve to destroy this illusion of success. Likewise, while it may be true that we have seen a decline in violence, mass genocide and the once enormous fatalities common to global warfare, we need to step back even further and remember the causality itself, not the mere trend of reduction. If resource scarcity and geo-economic strategy have been the cause of most national conflicts in the world in the past (which it has), then all it takes is that precondition to re-materialize. The rapid decline of human-environment relations in the past few decades is setting the stage for this once again. The 2003 Iraq war, by some analysts, was a resource war for oil, and this is rather difficult to deny when the evidence is weighed. There is little doubt that if the world was faced with real energy, water, food and mineral scarcity, to the extent that it would deeply affect the economies of larger national powers, we would regress rapidly back to mass global warfare and mass casualties, not to mention massive civil unrest as well. Today, all major superpowers continue to increase armaments and weapon power clearly in preparation for such events. On a different level, almost paradoxically, the very things that have been helping society increase its standard of living, science and technology, is also driving its increased vulnerability towards destruction. While science can, on one side, illuminate the natural alignments we as a species need to adhere to in order to find balance with the habitat and each other, it can also be used locally and narrowly, within the context of the distorted incentive structure the market perpetuates, to create and accelerate destructive and inhumane consequences. The atomic bomb is one extreme of this reality. Our increased, high-tech capacity to more efficiently destroy biodiversity, over use our resources and pollute, is another. In some ways, the rapid development of science and technology is pushing humanity into a corner. It is as though the species is marching farther back into the apex of a three-dimensional triangle, laid on its back, with its edges sloping quickly down, once passed over. One side is a negative acceleration into social and ecological decline and the other a positive acceleration into an age of abundance, balance, peace and progress. As time moves forward, the farther we move back into this apex, the less space we have. At some point, we are going to succumb to one side or the other. 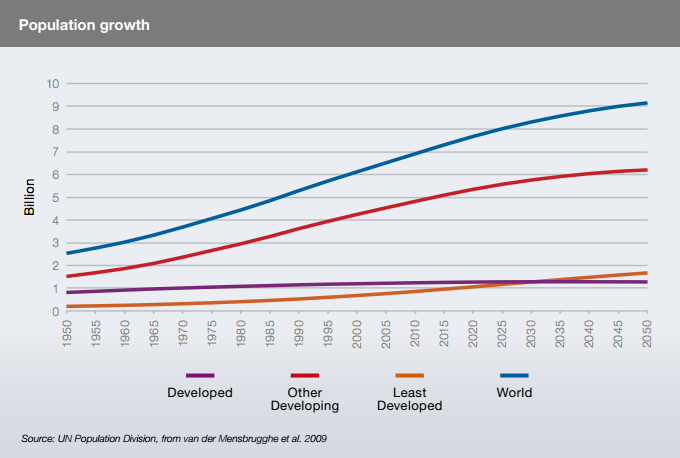 Statistics suggest that well over nine billion people will inhabit Earth by 2050, sourced mainly in the developing world. Along with this come dramatic increases in demand for (a) food, (b) water, (c) energy, and (d) minerals/material resources. Each one of these will be discussed. (a) As far as food, there is no shortage of studies that project that our traditional food production methods are not going to come close to meeting demand by 2050. Estimates put production needs at a 60 to 110% increase and given the current industrial climate which also has an extremely wasteful and inefficient supply chain, wasting 30-50% of all food created, the only logical expectation is a worsening of the global poverty and starvation levels in terms of population percentage. This doesn't even bring into consideration the ongoing plea for more sustainable agricultural practices to stop pollution/soil erosion, which would not be a convenience if this pressure accelerates, assuming traditional land-based methods are still in use. 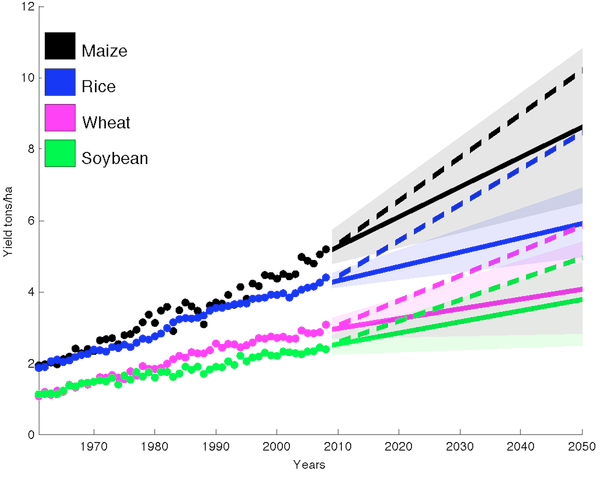 This chart shows yields per acre for the important foundational crops corn, rice, wheat and soybeans. The solid lines show what would happen if this growth continued. 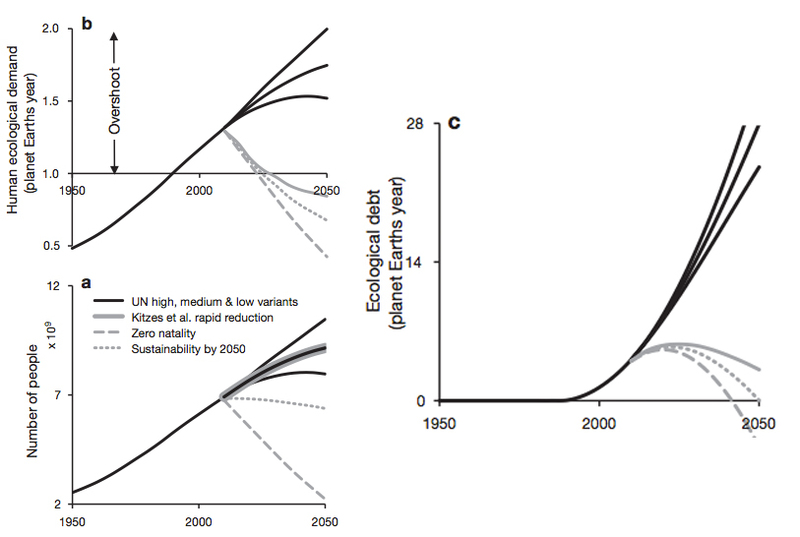 The dashed lines, however, show what is really needed to satisfy expected demand by 2050. (b) Potable water statistics are equally if not more dramatic, and needless to say, water scarcity means even more problems for traditional agriculture. According to the United Nations, by 2025, an estimated 1.8 billion people will live in areas plagued by water scarcity, with two-thirds of the world's population living in water-stressed regions. 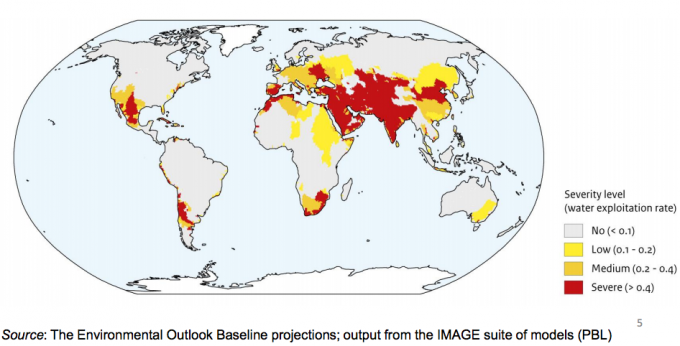 The OECD projects that fresh water demand will rise by 55% by 2050, corroborating the U.N. water stress statistic, extending it to 3.9 billion by 2050, or nearly half the world's population. Likewise, water pollution, which further compounds the problem, is on pace to continue as developing countries increase industry and agriculture in their interest to raise their overall standard of living. Sadly, this interest to increase industry will only further the pollution problem as the methods used are often much more primitive and environmentally dangerous than what the developed nations are slowly emerging out of. China is a case in point. While considered a developed industrial nation, its internal policies are excessively relaxed when it comes to environmental standards and regulation. This is a natural capitalist outgrowth as the intention is to free up commerce and further economic growth. Today, China contains 16 out of 20 of the world's most polluted cities and only further development, population growth and hence pollution is to be expected. As far as water pollution, globally, nitrogen and phosphorous contamination, mostly from agriculture, is now a major problem, creating both “dead zones” in certain surface bodies, along with making people sick who drink it via ground water. Likewise, many other pollution sources are ubiquitous. For example, air pollution from coal plants enters the atmosphere and then find its way into the ocean. The mercury released by the burning of coal then pollutes the fish and those fish are then caught as a food source, containing this deadly toxin, hurting human health. Given current trends, mercury pollution is expected to rise as well. In short, if all patterns stay the same, water, both in the context of its symbiotic relationship to biodiversity and its direct relationship to human survival, given that humans can only go a few days before dying without it, is on pace for severe shortages and extremely detrimental environmental outcomes overall. This again assumes we conduct ourselves in the same basic ways we have for the past 50 years, embracing market logic, which is life-blind and decoupled from environmental awareness. (c) As far as energy, as alluded to in the prior note about coal, there is literally nothing positive about any fossil fuel combustion process when it comes to environmental sustainability. These means will always have a detrimental footprint and it can only get worse as population and industry increases. Compounding this is also the fact that such resources are non-renewable and ensuing scarcity is simply a matter of time. Reproduced from Dr Michael R. Smith, CEO of Globalshift Ltd. 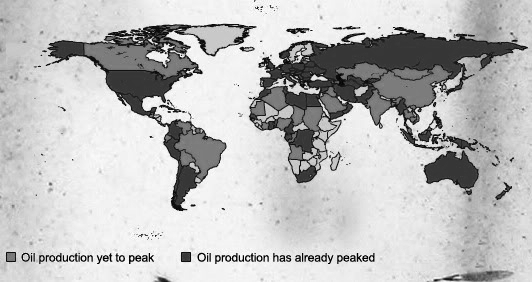 The issue of peak oil has been looming for many decades. While controversial, what we know today is that convention oil production, meaning the usual raw crude which used to occur in large vast pockets under the Earth's surface, is in decline on the global scale, with an estimated 37 countries already past their peak of production. Of course, many others today speculate that the world is still “awash in oil”, with grand speculations of future capacity. However, these projections are centered on non-conventional source that are often extremely difficult to extract and process. Oil shale and tar sands, along with “fracking” for natural gas, are currently accelerating methods and, on paper, they can give the sense of abundance. However, there is a great deal of dispute about just how viable these means are to meet growing demand, while the environmental costs of these complex and often destructive practices are vast and counterproductive. Likewise, hydraulic fracturing or “fracking” has been found to be exceptionally polluting and dangerous with even recorded instances of ground water being so polluted that home water supplies have become literally flammable. Regardless of such contaminated water supplies, given the dangerous air pollution, destroyed streams, and devastated landscapes, fracking continues to accelerate globally. The bottom line is that the fossil fuel economy is unsustainable. The economic manner by which this will become apparent in the current model will be through extreme price. The visceral problem is how supply and demand will set up a condition where scarcity will raise prices so high that industry and public simply can't afford it. This would severely limit the entire facet of industry itself since fossil fuels and hence energy are what move agriculture, production, distribution and the like. At the same time, these practices could bring human society in a pollution nightmare that could take generations to overcome. In a 2011 study published, which was in part a response to an ongoing general call to isolate and protect certain regions of Earth to ensure the security of biodiversity, it was found that even with millions of square kilometers of land and ocean currently under legal protection, it has done very little to slow the trends of decline. Today, one could search through all peer reviewed scientific documents in the world and likely not find one review of humanity's resource and biodiversity relationships that are neutral or positive. While estimates may vary, one thing is clear: the species is growing rapidly and expanding its industrial activity in a climate of absolute deficiency with respect to the unsustainable methods and values being put forward. It is important to remind the reader, however, that this problem is a system issue, not an immutably empirical one, once again. The problem is not our mere existence or a growing population. The problem is that we have a global economic tradition in place rooted in 16th century, pre-industrial, handicraft oriented thought, that places the act of consuming (buying and selling) at the core of all social unfolding. A good analogy is to consider the gas pedal on a car. The more consumption of fuel, the faster it goes; buying things in our world is the fuel. If you slow down consumption, economic growth slows, people lose jobs, purchasing power declines and social conditions destabilize. This is an artificial reality generated by misaligned economic principles, not the physical reality itself. While the preceding sections have addressed specific, major issues in some detail, we cannot overlook the economic synergy which links them all in the financial and technical systems related. Energy, water, food and material accessibility interlock into one societal mechanism, which can have dramatic effects on employment, social stability, and many other issues if any one of them is disturbed. Likewise, from a mere production standpoint, 70% of all freshwater is used for agriculture. Any large-scale water scarcity would then also mean reduced yields, assuming the same traditional practices are used for cultivation. The same goes for energy, especially hydrocarbons. The effect of a substantial reduction of these resources on traditional agriculture alone is staggering, while the effect it would have on industry as a whole as far as the vast amount of petroleum-based products and power needs would be nearly apocalyptic in the current model. We also cannot overlook the social stability issue and how the decline of such resources will change human, social and national behavior, inciting indifference and a loss of empathy as fear and narrow self-preservation is triggered and exacerbated. We can imagine, for instance, a steep price increase in gasoline where it becomes unprofitable for those transporting critical, life- supporting materials. The result might very well be a union strike that stops the flow of goods, compounding the problem. Imagine for a moment if the dominant food transport unions on the west coast of America went on-strike, stopping the flow of basic commodities. This could spark a highly detrimental chain reaction. Scarcity breeds crime, conflict and anti-social behaviors. On the micro scale, it is not difficult to see the increase in gangs; theft and prohibitive underground economies flourish in this climate, as they have statistically proven to do so in regions still enmeshed in great poverty and a lack of job opportunities. Disease, and other issues arising out of such poor conditions, is another viable concern. On a macro level, as noted prior, national war has historically mostly been driven by resource scarcity and national/business self-preservation. It should be no surprise that America and many other nations have been beefing up nuclear arsenals and delivery systems for some time,  with the world currently capable of destroying itself many, many times over with its existing arsenal of over 26,000 nuclear warheads. Thousands of these weapons remain on high alert today, ready to be fired at any time and the reaction of the global outcry to stop proliferation has literally been met with more proliferation, behind the scenes. At the same time, the mechanics of the global financial system are also in play. Since all money is created out of debt and loaned with interest attached – interest that actually doesn't exist in the money supply outright – there is always more global debt in existence than money to pay for it. This has culminated into vast personal, business and government defaults, both real and pending. A 2010 report from the Standard & Poor’s rating agency estimates that the United States will have a debt of 415% of GDP by 2050, while by 2060, 60% of all the countries in the world will be bankrupt. A cursory glance at the financial status of most countries in the world today reveals a spectrum of medium debt to extreme debt. Amazingly, there appears to be no country on Earth with a balanced budget, and as of early 2014, the public debt of the planet is equivalent to about 52 trillion dollars. However, that is just public or government debt. The real figure, combining both public and private debt is a staggering 223.3 trillion dollars. Dividing that number by the 7.1 billion people on the planet as of early 2015, we find that each human owes about $31.5 thousand dollars. So, we have to ask ourselves: how possible is it that we are going to be able to financially facilitate the vast technological reforms needed to generate some degree of sustainability when it is clear that massive overhauls of our agricultural system, water processes, pollution control, energy sources, infrastructure and industrial methods are desperately needed? We know we have the technical means to do it, but do we have the money? The more one thinks about this latter question, the more incredible and outright idiotic the financial mechanisms in play become. It isn't that some progress will not be made, as the major powers in the world pretty much don't take debt seriously to begin with. The difference between a 1 trillion dollar deficit and a 100 trillion dollar deficit is only as important as the ability to service it. In truth, the major powers know the full amounts will never be paid back and the process of alleviation will likely take a political form rather than financial, likely in the context of market incentive negotiations, geo-political negotiation and resource acquisition negotiations. However, those deals are usually behind the scenes and the growing pressure to cut social programs and spending on what are more often than not the very programs that help keep some order, continues for the sake of public perception and other levels of differential advantage. Likewise, while the larger powers have great advantage in this predicament, the smaller developing countries are the ones who really suffer, as they have no economic or military power to gain clout in international appeal. Given this, it is easy to see that the developing countries will be the ones firmly underwater, continuing to be vulnerable to austerity, exploitation and the basic ignoring of its internal social strife. In 2011, the United Nations noted a statistic that 1.5 billion people were living in “absolute poverty”, with a representative from Nepal at a pertaining conference adding that “at the rate of decline observed from 1990 to 2005, it would take another 88 years to eradicate extreme poverty”. If we reflect on the rapid economic growth that occurred from 1990 to 2005, which was considered by many a “boom” period for much of the world, we see that the existing negative pressures were not even close to what we are seeing two decades later. Hence, it is logical to speculate that what progress (growth) was achieved in the 1990s with respect to the rather minimal percentage reduction of extreme poverty is likely to be reversed as exponential population growth amidst an ever-deteriorating financial and environmental situation accelerates. Likewise, and as a final topic of this section with respect to emerging negative pressures, we have the issue of technological unemployment. As partly expressed in the essay Market Efficiency vs Technical Efficiency, machine automation is rapidly evolving to mirror or exceed the vast majority of industrial activities common to human laborers. A 2013 study out of the University of Oxford states “45 percent of America’s occupations will be automated within the next 20 years.” Given America's advancement, this naturally also implies that half the world's occupations could be automated as well. More specifically, a detailed examination of automation technology by sector at the present time, both in the fields of manual labor and the service industry, show that there is really no tangible occupation in existence that isn't on pace to being replaced by machine and/or artificial intelligence. It is simply a matter of time and intention. Unfortunately, the market economy is predicated on people “earning a living” and cycling money through the society to maintain economic stability and growth. This, of course, means such a trend is actually economically detrimental in the context of the market system. Likewise, since such automation technology is subject to Moore's law, or more accurately ephemeralization, such machines are getting cheaper and eventually they will become more cost effective than hiring human beings, who require insurance, vacations, a limited number of hours to work a week, and so forth. The productivity now possible is exponentially more effective with machines than with people, and this reality will only increase as time moves forward. Yet, this creates a system contradiction, for if machines displace people, how do they get income to cycle money into the economy by purchase? In traditional market principles, there is no solution, other than the false assumption that humans will constantly shift in exact accord with such labor displacement. This might have worked in the mid 20th century, but it will no longer work given the rapid, exponential advancement of modern technology today. Even more, it could be well-argued that it is socially irresponsible not to pursue this new attribute of our means of production for it removes humans from unsafe and monotonous, life-wasting roles, possibly freeing them also to do more sensitive, creative, high-order things. Such a transition, however, would require the entire edifice of market capitalism to be uprooted and replaced by a new social approach that does not require labor-for-income. “Business acumen” can be defined as “keenness and quickness in understanding and dealing with a business situation in a manner that is likely to lead to a good outcome.” Put another way, it is about gauging each situation to best maximize profits, in the most strategic way. This is brought up to convey two related propensities that have a great relevance in the way most people, particularly the wealthy, will likely cope with increasing scarcity and/or social destabilization. The first is the rather simple observation that the pursuit of business is really nothing more than the pursuit of money. While the business mindset will often romanticize about “helping the world” and “pleasing consumers”, the only real measure is profit. It is simply assumed that gaining profit means helping the world, which is clearly not the case given the vast declines in our habitat integrity and the fact that there are now more slaves in the world than ever before. A study titled “Class and compassion: socioeconomic factors predict responses to suffering” revealed that lower-class individuals respond with greater compassion to viewing human suffering than upper class individuals. In a related study titled "Social Class, Contextualism, and Empathic Accuracy" it was found that individuals of a lower social class are more empathically accurate in judging the emotions of other people. In its three studies, lower-class individuals received higher scores than upper class individuals on a test of empathic accuracy; judging the emotions of an interaction partner; and made more accurate inferences about emotion from static images of muscle movements in the eyes. In a report titled "Having Less, Giving More: The Influence of Social Class on Prosocial Behavior" it was found that across four studies, lower class individuals proved to be more generous, charitable, trusting, and helpful, as compared with their upper class counterparts. A 2012 article in the The Chronicle of Philanthropy reports that low-income people give a far bigger share of their discretionary income to charities. People who make $50,000 to $75,000 give an average of 7.6 percent of their discretionary income to charity, compared with an average of 4.2 percent for people who make $100,000 or more. Now, such reports are not noted to suggest this is a universal phenomenon. However, there is clearly something going on in the psychology of those who become wealthy and a heightened sense of protection, indifference and entitlement seems consistent. With this in mind, let's return to our consideration of how different classes would respond to threatening social circumstances. Given the fact that the world now has almost 2,200 billionaires worth about 6.5 trillion in total (that's an average of 2.9 billion each), with the top 100 capable of ending global poverty four times over, a great deal of attention has been placed on these figures in the hope for social help. Given the anger that has risen due to the reality of tremendous and growing inequality in the world, one can imagine the general sense of unease of those who are super-rich. Yet, apart from what could be argued as a public relations move, combined with both honest intentions and the specter of philanthropy, such as the so-called billionaire's “Giving Pledge”, one can't help but feel deep animosity for such figures and the system that enabled their extreme and clearly unnecessary wealth. This, again, isn't to say anyone is “bad”, but rather to note that any system which has the capacity to even create such extreme wealth imbalance, in and of itself, needs to be addressed as the root problem it is – not the supposed charity of those who have been able to play the market game to such an extent as to accrue such irrational and wasteful sums. It is not a cynical view in this light to consider such things as the “Giving Pledge” as more of an insult than a solution. So given the noted psychological studies put forward and the current state of extreme and growing wealth imbalance and destabilization (good intentions by the wealthy aside), there is no evidence that the rich will save us. If current trends remain, as they likely will, the rich will simply isolate themselves more and more in fear and protection as problems continue to emerge. This propensity also applies to the entire chain of social stratification in general as narrow, short-term self-preservation will always be a knee-jerk tendency when one finds his or herself susceptible to financial loss and as the studies show, the higher a given person is in class status, the more indifferent they tend to become. This is the signature of “class war”, and as these trends persist, we can hence expect increased uprisings and anger at the state of affairs and gross imbalance in society. While this may seem like an elusive kind of phenomenon, it should be thought about in the same context of other negative factors, such as resource depletion, unemployment and the like. An angry population can become a divisive and violent population, and the emergence of large-scale social insurrection can have very negative social consequences if root causes are not clearly understood. The idea of transitioning fluidly out of the current model into a NLRBE can be a daunting and difficult speculation. Perhaps the first consideration is to think more deeply about what it is we are transitioning into exactly. In many ways, this move from a scarcity-preserving economy to a system of direct resource management and scientific application in the pursuit of a post-scarcity or abundance economy to meet the needs of the human species, while securing the integrity of the habitat, is really a transition of values. At the same time, it is also a transition of operant reinforcement, which simply means the new structure actually works to reward conservation, balance, social contribution and ecological respect, rather than what we reinforce today, which is essentially selfishness, competition, consumption and exploitation. In fact, the market system could gesturally be viewed as not a “social system”, per se, but an anti-social system. As far as physical transition itself, it is naturally naive to assume we can predict the future regarding such a vast societal shift, especially given how forceful and present the pressures are that keep the current system in place. All of us are coerced on a daily basis into this market psychology in order to maintain survival, and hence our values are deeply associated to these methods, practices and general worldview whether we like it or not. It could even be said that these pressures generate a "syntax" of thought, if you will. Our brains seem to wire themselves as we engage the environment, constantly reinforced by existing pressures and our responsive actions. Just as a person can learn a skill and have that skill become "second nature", without much direct conscious thought to execute once learned, we humans perform actions constantly with the same kind of learned, subconscious patterning. For example, we often don't even know we are behaving in so-called "narrow selfish" ways at times, since everyone around us appears to be working in the exact same manner, creating perceived normality. Therefore, TZM naturally views the shifting of people's values as the most important necessity for transition. How this is done is deeply related, of course, to education, while also attempting to actively create conditions that, again, hopefully reinforce these new, sustainable values, inching out larger order change. That stated, there are perhaps two broad ways to think about transition, with the first giving something of a logical framework for the second. This first scenario assumes that there is the basic sanction of the political/economic power structure and the community overall. It assumes that the human species has definitively decided to make this move in a step-by-step manner on the global scale. Of course, the sad truth is that it would likely never happen this way. Yet, this hypothetical is expressed because the reasoning inherent is relevant with respect to how we think about transition as a general process and certain attributes noted would likely still come into play in the second scenario. This second scenario is the more realistic scenario as it assumes there is no large-scale public sanction and the transition must originate from activism and influence. This essentially looks at exactly where we are today, taking into account the vast range of divisive opinions, political polarization, national hatred, commercial warfare, etc. So, to conclude this introduction to transition, it is also worth noting, as an aside, that many who criticize The Zeitgeist Movement do so not because they disagree with the direction but because they do not understand how to get there. A relevant analogy to counter this argument is the idea of a very sick person seeking to get well. This person might not even know the cure or the medical path to get there, but given his or her life is at stake, the task to learn and try to realize the proper means toward resolution does not end because of mere ambiguity. Likewise, the difficulty or confusion in transitioning into a NLRBE does not remove the necessity for it. The fact is, we are all humans on this planet and we can change the world quite easily if we can find unified, shared common ground to relate. Furthermore, it's also important to note that we are always in transition to one degree or another. There are no utopias and even if we accomplish only 50% of such a move, as we may define it in theory, it would still be well worth it. A systematic move from the market economy to a NLRBE could theoretically occur through a step-by-step "socialization" of the core attributes of the societal infrastructure. Essentially, we dismantle one layer while implementing a new one in the most fluid way we can. This term "socialization", which is of course a stigmatized notion in the West given the hyper-glorification of the market economy and the demonization of anything otherwise, is still technically appropriate to use in this context, bias aside. This simply means that the necessity of money and the market mechanism would no longer apply to the given social attribute (not that a traditionally “socialist”, in the political and economic sense of the word, structure would replace it). Direct, advanced technical means would produce and distribute without a price tag, meeting these needs directly. As noted in detail in prior essays, a critical component that enables the new social model to produce a high standard of living is the liberal application of modern technology and a systems approach to social organization based on strategic technical efficiency. Since the current model is literally based on a technical inefficiency to keep it going, the more technically efficient the system becomes, the less traditional labor is required. Therefore, in a transition starting from within the market economy, measures to compensate for this financial loss are required. These can consist, in part, of the adjustment of wages to compensate for job losses, along with the shortening and sharing of the workweek to also compensate. The core societal attributes to be discussed for this exercise consist of (a) food production, (b) utilities, (c) basic good production and (d) transportation. Obviously, these fragments have a synergistic relationship, which require other types of technical evaluation. However, since these core attributes of our day-to-day lives are essentially what maintain our general health and basic standard of living, these abstractions should suffice for the sake of simple reasoning exemplification. It is also worth noting that the post-scarcity relationships denoted in each subject can be explored more so in the essay Post-Scarcity Trends, Capacity and Efficiency. The technology for high efficiency, automated food production is now a reality today, with vertical farm technology and low energy/low impact cultivation methods such as hydroponics, aquaponics and aeroponics. Desalinization processes, for example, could enable the building of these vertical farm facilities along most major coastlines, producing organic food in quantities to meet and exceed the needs of the regional population.In short, if such advanced methods were implemented, the strategic abundance possibility reveals that the need to place restrictive monetary value on basic food resources is simply not required. There is no legitimate technical reason, even within an existing monetary economy, grocery stores today cannot provide the same produce resources to a given regional population, without the need for financial exchange. It is simply a matter of getting the advanced automated systems in place. The hydrocarbon economy today continues to cause a great deal of turmoil, not only on the environmental level but also due to the inevitable scarcity of the resources themselves. While the debate continues regarding "peak oil", there is no legitimate debate as to the fact that fossil fuels are essentially finite and its combustion is detrimental to the environment. Given the advanced state of renewable energy means such as solar, tide, wind, geothermal and the like, coupled with advanced localization means, there is no reason any of us would need to pay for energy if the system was properly designed. Advanced solar systems alone applied to every existing structure, even feeding excess energy back into a community's redundant base-load grid, would eliminate electricity needs immediately based on current statistics. The same phenomenon also assists with natural gas and water utilities. Since electricity can be used to replace gas for heating and most other utility purposes, its use can simply be designed out in this context. Water, which is of a generally nominal financial expense today in the West, can be made dramatically more abundant via further industrial efficiency to recede pollution and maintain a regional surplus by strategic use. Those who do have water shortages in the world have had technical resolutions for years via desalinization and other purification systems, both on the large scale and small scale. It has been, again, the lack of financial resources that have caused the problems, not the lack of technical ability. The spectrum of basic good production is wide, ranging from core staples such as household items, clothes and communication technology, to specific tools for specialized tasks, such as musical instruments and other increasingly less demanded items. The best way to think about this is as a “spectrum of demand”, with daily needs on one side and specialized, or "luxury" type goods on the other. While the advancement of automation technology will likely facilitate a vast amount of variation in production once the revolution in modular robotics and nanotechnology comes to fruition, for the sake of transition in the immediate future, we can think about industry in the more established context. Overall, each industry or sub-industry could be unified in operations to enable the highest level of production and output efficiency possible as a deliberate whole. In other words, the corporate structures would combine based on genre or sector, using that collaborative capacity to increase efficiency, while reducing waste and competitive multiplicity. This would set the stage for the creation of a fully synergistic industrial system, applying advanced, ideally simplifying automation processes liberally at every turn to remove human labor and inevitably increase efficiency. In this, primitive versions of the Collaborative Design System, as described at length in the essay The Industrial Government, could also gain traction. While certain limitations would occur given the absence of larger order cooperation, the inching in of this process would set the stage for larger incorporation while also increasing sustainability. Now, returning to the prior point about compensation for the loss of paid work hours, the loss of sales naturally means a loss of growth and hence a loss of jobs. In the current model, this is structurally a negative thing, of course. However, in this hypothetical transition proposal, wages would shift in proportion to the resulting job losses and/or with the shifting of workday hours. In other words, assuming an initial average work day need of 8 hours per person, incurring a loss of jobs by 50% due to the application of automation and new levels of technical efficiency, the work day would then be cut by 50% and spread across the existing workforce, keeping everyone employed but for a shorter period. So, if we had a hypothetical economy with 1000 people and 50% of them were displaced by this deliberate technological unemployment, the workday is then divided between them so everyone now works only 4 hours, instead of 8. Again, the fact that these goods and services are becoming free in the economy means that there is less of a need for prior levels of purchasing power. Therefore a 50% cut in wages is calculated to be directly compensated for. Overall, we are phasing the monetary system out in this process. In cases where this isn't feasible, there would be an increase in hourly wage rates in the same basic proportion, compensating for the average losses incurred. In theory, this hourly reduction of the total workforce, assuming 100% employment through these standards, coupled with the compensating increase in now free resources, would fluidly move the society out of the labor market over time. Again, this is the abstract hypothetical. The next social staple is transportation. The production of vehicles, which is already largely automated today, is one consideration and this isn't much of a problem to perfect. This issue here is access, application and necessity. Of course, this thought exercise could be quite elaborate. If we were to calculate the vast amount of energy and resources used on a daily basis today for all of us to travel to centralized offices, usually participating in occupations with questionable relevance in the broad view, we would be amazed at the inefficiency apparent on the whole. While there are certainly exceptions, there are very few occupations today that really require direct location interaction anymore, given the vast power of the Internet and such communication tools. Even industrial production facilities, once further automated, would only require a small number of people on location, with most processes administered remotely. So, with a strategic move to simply stop from wasteful 9-5, 5 day workweek, traditional travel to work and back would create a great alleviation of pressure on many levels. Having everyone equipped by whatever means needed to operate their business function from their homes is a logical and sustainable idea for energy reduction, reduced accidents, reduced pollution, reduced stress and the like. Beyond that, as far as infrastructure, systems of sharing, such as the currently existing rental street bicycles and the like, should be applied to vehicles (and everything else we can), coupled with the liberal incorporation of mass transit. This, again, is to be a step-by-step process of improvement where different regions are purposefully reorganized to favor the highest level of technical travel efficiency possible. In short, localizing labor locations/remote access to limit travel needs, coupled with sharing systems for vehicles and liberal mass transit, would profoundly change the nature of transport infrastructure, easing into the foundation of a NLRBE, even if some of those services still need money to pay for them. Now, with the following truncated yet logically purposeful train of thought towards a hypothetical break down the current system and a systematic implementation of attributes of the new one in mind, let's now take a realistic look at what a transition to this new society may hold given the complex and dichotomous reality we endure today. It's first important to understand that the intention of social and environmental sustainability has been developing under the surface of culture for a long time. For example, the now common notion of the "green" economy, which is being pushed forward by environmentalists, coupled with periodic outbursts by civil rights groups such as Occupy Wall Street, reveals a deep seeded interest to aspire for a world that is more equal, humane and sustainable. While our current social system, as argued, often reinforces the opposite of those values, it still seems that deep down most of our core historical philosophies still suggest an interest in social equality and sustainable balance. So again, it is important to acknowledge that in order to really create a more sustainable, humane world, a complete move out of the current social architecture is required. Otherwise the same basic problems will persist, even if reduced to some degree by half-measures. To do this, global social movement tactics become critical to put pressure on the existing system, along with helping change the intents and values of the culture itself by vast education and communication projects. However, before such ideas are addressed, it is worth revisiting the issue of “societal collapse”, this time in the context of what we could term eco-bio-social pressures. A backdrop to our cultural evolution are pressures that can take both a positive and negative form. Positive pressures of this nature could include the development and expression of life-advancing technologies where the viewing public is so impressed by the possibilities, the social demand for that feature or implementation becomes unwavering. On the other side are the negative pressures, such as the dramatic failure of a social edifice that shocks the culture and creates unease, loss of confidence and a dire interest in problem resolution by new methods. Given the prior section on societal problems we can logically expect as the current model grinds along, that these negative pressures are bound to help facilitate new incentives toward change. Of course, this is out of the control of TZM and at no point does TZM promote furthering any harm upon anyone. TZM focuses on positive pressure influence in its activist work, showing the world what can be done through education and think tank projects. Yet, TZM does not deny the existence of these other emerging negative pressures and acknowledges them also as a form of mobilizing incentive. It is also important to note that so-called “societal collapse” is not an absolute distinction. It is relative. In general day-to-day operations, specifically in the West, one typically does not look around and deem the society as being in a state of "breakdown". This is because most people have simply become accustomed to the pollution, cancer, debt, homelessness, depletion, poverty, wars, uprisings, periodic financial crises, unemployment and other inefficiencies. It isn't as though one day everyone wakes up and finds the whole world suffering or dead in the streets. Societal collapse, or system failure, is a process and the real question is actually how bad are we prepared for it to become before we act to change it. In truth, all systems change and while such a process of failure is a very negative thing in the short-term, it is also ultimately a natural consequence of cultural evolution. Problems can lead to creativity and creativity leads to new solutions, if we are willing to move on. At any rate, with these eco-bio-social pressures apparent, coupled with a basic understanding of how a step-by-step transition could unfold (scenario one), let's now talk about transitional activism. The goal here is to not only facilitate a move to the new model, but to also work to help those suffering in the current model, basically bringing them in first in this process of transition. This is done by creating parallel systems, which do not use money but still provide helpful services to people. With growing technological unemployment and most governments and corporations still looking the other way for as long as they can, creating solutions to ease this stress on the population, coupled with removing support for the current system, is a win-win goal. For example, the use of mutual credit systems or “Time Banks”, facilitate a kind of non-currency transactions, often based upon labor only. While taxation of these transactions apply in some countries, this system is able to bypass money overall (i.e. for those who have skills but are poor), along with reducing overall financial circulation (as a means of protest and transition). A mutual credit system is a form of barter for services or goods, which allow non-monetary exchange values to be applied to other goods and services, removing the 1:1 good to good correlation common to simple barter. LETS is an example. It assists an interest free, non-inflationary form of exchange where value cannot float or fluctuate, as it does today, among many other positives. In the case of the “time bank”, it is based on the prior work of the person, in effect. There are a number of variations of these kinds of systems and they are becoming ever more sophisticated in their programming and malleability. Another tactic, which has a similar effect, is the use of community sharing systems. TZM Toronto, for example, has a tool sharing network where basic tools exist in a facility, like a library, and one can check out these tools in rotation, as needed. As minor as this may seem, it is easy to see how this library concept could extend greatly in a community, such as with automobiles and other items used more sparsely. Again, this would help those who didn't have a means of access, along with removing growth pressure for the economic system. It would also be more environmentally friendly and sustainable, needless to say. Likewise, more traditional social policy influencing methods, such as mass online petitions and other such acts are to be viewed as minor in effect but still relevant for awareness. TZM does not endorse physical protest in the sense of piling into a parking lot and yelling at buildings as an effective means of social change, but it does not dismiss them either as such activities can draw attention toward a given issue to some degree. Likewise, petitions have been ubiquitous in the world today, along with working to influence political officials by also publicly challenging them in the purview of news media. These are other such expressions that come down to one's creativity, courage and personal interests. However, there is one specific political lobbying proposal worth mentioning that has been around for a long time. While not a long-term solution in and of itself, its implementation would at least generate improved public health and eliminate general poverty. It is called a “guaranteed” or “unconditional income” system. This simply means people are given basic life-supporting funds each year to meet basic needs, with no one left behind. In late 2013, activist groups in Switzerland were pushing very hard to implement this idea. Now, all that aside, TZM's most important activist initiatives are the ever emerging think tank style projects, which literally can work to show a better way. R. Buckminster Fuller once stated “You never change things by fighting the existing reality. To change something, build a new model that makes the existing model obsolete”. This is the transitional motto of TZM as well. As will be expressed in the essay “Becoming The Zeitgeist Movement”, apart from general awareness events, think tank projects that can literally start to build the new social model, both physically and in its programming for sustainably and efficiency, is perhaps by far the most profound method of activism. The digital revolution has taken the complexity and arduous development process of industrial design and provided the option to virtually represent most any physical idea for the sake of communication. Likewise, while the Collaborative Design System noted prior may not be in existence today, there is no reason programming for it cannot be created now, even if it is to merely exist as an over simplified “mock-up”. Likewise, the Global Redesign Institute, which is a macro-industrial design interface designed to enable anyone to think about the logic of redesigning the topographical layout of Earth, is another idea. In the end, the range of possibilities to virtually create almost exactly what TZM speaks of is becoming more possible and this has powerful communication potential. We can imagine, after these developments occur, large-scale conferences that can be conducted in any given region, showing how much more efficient that region would be, if such technical system or designs were implemented. Building on the prior paragraph, imagine a fairly small country with a vast range of natural resources (a possible realistic location could be a lush country in Latin America). It is some time in the future and technical progress has been continuing its phenomenon of doing “more with less”. The result is such that known methods of industrial production now require fewer raw materials – to such an extent that if a well-organized, resource-rich country adapted strategically - there would be no need for imports or exports in that region. The country could be “off-the-grid”, so to speak, in the context of globalization and international influence. However, the leaders of this country really were not aware of this technical reality. So, one day a relative of one of the leaders finds his or herself at a TZM conference talking about those very design initiatives and advancements in production methods. This person notifies the leaders of the country and the government takes notice. This hypothetical government is perhaps impoverished, as many Latin American countries are, mostly due to international trade dealings, corruption, debt problems, unemployment problems and the like. This government, enlightened by what they have learned, decides to take the initiative to incorporate a localized NLRBE, as best they can. They understand that a true NLRBE is global, with a total Earthly resource management system. However, knowing this will not occur anytime soon in the current global climate, they calculate that with a number of adjustments, they can still utilize the model to a limited but powerful degree, solving most all of its country's material/financial woes. So, the country then adjusts its industrial methods in accord, creates a domestic sensor system and management network to understand its resources and keep equilibrium, fully digests the new industrial capacity to do more with less, also installing the sustainability and efficiency protocol algorithms inherent to the CDS - and they proceed with the new model in full force, literally stopping all trade with foreign nations, being self-contained and 100% sustainable in their region, once established. After a period of this success, the world slowly begins to see the incredible result of their moneyless economy. The population, which had a very low standard of living prior, is elevated to an economic abundance they have never seen. It helps greatly that the people's values in that country consist of conservation and modest living, furthering balanced progress of the nation. So, given this evidence of feasibility and fruitfulness, other adjacent nations begin to understand the vast merit of the new model and decide to take part. This process of joining expands the resource network greatly and the more it expands, the more other country's people also see the merit and the more they demand it, and so on. In time, the world unites. Now, while this example might be over simplified, also clearly ignoring the international political pressures that most certainly would cause conflict, the reader should be able to understand that it is still a possibility. In truth, we don't really know what exactly will start such a move, but we do know that planting as many “seeds” of possibility as possible is the key, coupled with the increasingly negative eco-bio-social pressures that will appear to have no end in sight. ↑ As an aside, it is important to qualify that market capitalism is not deemed the sole root of the problem. Capitalism is a symptom as well, birthed out of the fear-oriented psychology inherent to the historical condition of a scarcity-saturated society. ↑ See globalshift.co.uk for more country details. ↑ See the essay Post-Scarcity, Trends and Capacity for why this is so. ↑ The idea of partially achieving a NLRBE might be confusing to some. This statement is made to express how certain management practices and half-measures, constituting a "hybrid-economy" are not out of the question toward some degree of sustainable, abundance generating progress. This will not be explored in this essay but the possibility is worth personal consideration. This page was last modified on 25 January 2016, at 13:09. This page has been accessed 3,672 times.